Dateline Bangkok: "Attacked by Freddy Krueger..."
Elton John accepted damages from The Sun yesterday, after suing the newspaper for libel. 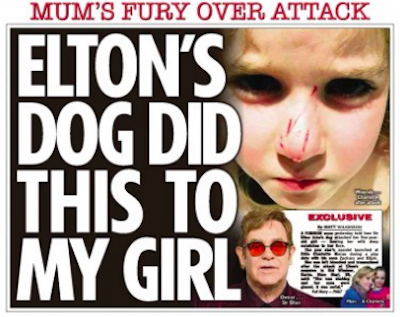 In a front-page story published on 11th February, The Sun on Sunday alleged that one of John's dogs had savagely attacked a toddler, and that he was not concerned about the victim's injuries. A double-page spread described the victim as "looking like she was attacked by Freddy Krueger" and claimed that she was "yet to receive a phone call from Sir Elton," though his solicitor argued that "the injuries were not serious" and that John had "made several inquiries about the girl's welfare".